Last week, I happened to go to the farmer's market around the corner, just looking to see what looked good. I found a stand with these enormous just-dug sweet potatoes, and decided I should buy a bunch - I was very in the mood for a fall-themed side dish. I was also in the apple stand and decided to try a fruit I'd heard a lot about but never tried - quince. It's kind of like a really tart apple. I looked a bit on Recipezaar to see what I could do with sweet potatoes and apples, and I came up with a lot of different casseroles - so I decided to give my own shot at a fall-style casserole, with Thanksgiving coming up soon. I gathered a bunch of other fall-themed ingredients like pecans, pumpkin and craisins to give it a more authentic autumn theme. (The sweet potato roasting method is from the November/December 2008 issue of Cook's Illustrated). This casserole is what I came up with - it was bursting with autumn flavor! 1. Line baking sheet (or two) with aluminum foil and cooking spray. Coat sweet potato rounds with a bit of canola oil, salt and pepper. Lay sweet potato rounds out in one layer on sheet. Cover tightly with foil and place in a cold oven, then turn it to 425. DO NOT PREHEAT. Let potatoes cook for 30 minutes. 3. Meanwhile, caramelize sliced onions in the oil over med-high heat. 4. Melt margarine in another pan, and combine apples, pecans, nutmeg and brown sugar. Caramelize together till apples are well coated. 5. Finally, in one more pot combine apple juice, lemon juice, maple syrup, rum, craisins, cinnamon sticks and allspice. Cook over medium heat until reduced by about half, or until the glaze reaches a moderately thick consistency. 6. Once everything is finished, spray a casserole dish with cooking spray. 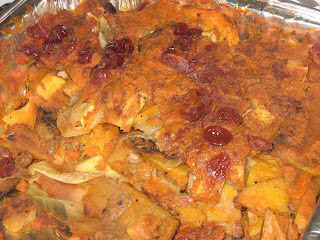 Build the casserole in layers: first a layer of sweet potatoes, then a layer of onions, then a layer of apples & nuts, then spread one can of pumpkin evenly over everything. Salt the pumpkin layer to your taste. Repeat with one more set of layers, except instead of salting the top pumpkin layer, sprinkle cinnamon over it. Pour the glaze over the top of the casserole (you can keep the cinnamon sticks for garnishes), and serve! 7. Leftovers taste really, really good. 2 Weight Watchers points per serving. whoa they have quince in the US? I only ever saw it in Buenos Aires (membrillo)... it makes a really good candy/jelly/dessert!